I remember a time before computers. Sure, actual computers have been around since as early as the mid 1930’s, but most computers were not accessible to the general public until the later 1990’s when I was already out of High School and beginning college. It wasn’t until the internet came in to play that everything changed, and computers began to get smaller and smaller. I also remember a time when the closest thing to a computer in school was a book or a type writer. I looked forward to getting new books every year, just so I could cover them with a brown paper bag! I loved to draw designs on these paper jackets, pay tribute to my favorite music groups, and draw just about anything my teenage mind could come up with. This was the inspiration behind this project. Why not “cover” the modern book, my little MID brand tablet. 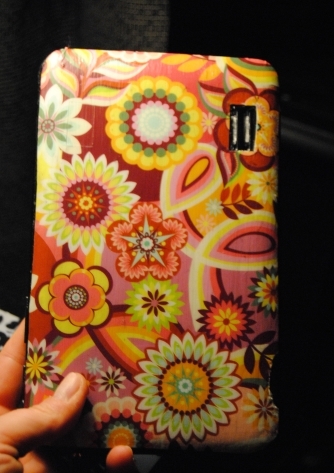 I loved the result I achieved with decoupage smart phone makeover So, I decided to give it a try. I prepped the tablet cleaning it and removing any dust. 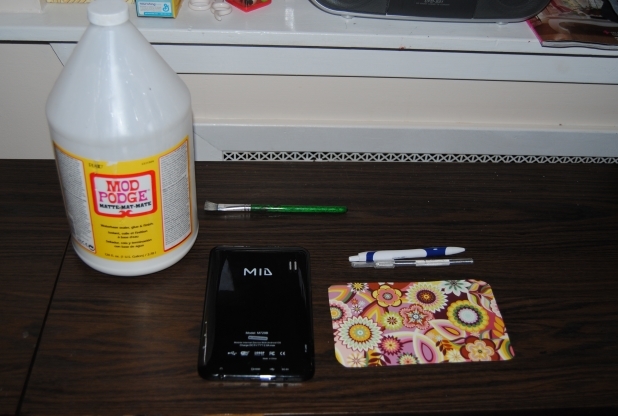 I then traced the tablet onto the scrapbook paper. I picked a nice brightly-colored scrapbook design. Keep in mind the design possibilities are endless! Joann Fabric had a great sale, five sheets of selected papers for only $1.00! Once traced, I cut the it out, carefully cutting away the speaker area with an X-Acto knife. I also paid close attention to any other areas I did not want to cover with the paper. Next, I applied Mod Podge to the back of the tablet, carefully avoiding any areas that might not tolerate glue, like the speaker for example. I carefully glued the scrapbook paper to the back of the tablet, mind fully and with a smaller paintbrush. This kept the glue from getting into any of the important areas. If you are worried, you can also put a small piece of scotch tape over those areas to protect them, carefully peeling it off later. Once dry, I covered the outside with multiple coats of Mod Podge Matte finish allowing to dry thoroughly between coats. I love the new look! 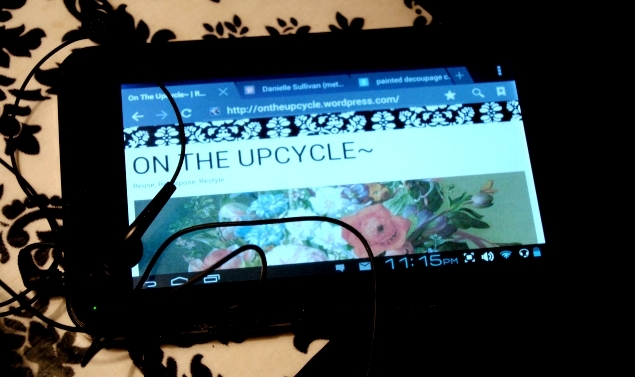 Who says an ugly tablet doesn’t deserve a decoupage makeover? AWESOME……OF COURSE.Especially with my favorite paper. Yes I love this design! Had no idea what I was going to use it for when I bought it but I had to buy it!